Yesterday might have been Super Bowl Sunday, but beer manufacturers had more to be excited about than just watching the game. People all around the country were chugging beers like Monday was a holiday (which it probably should be) and racking up quite a tab at their local liquor store. In some states, buying a few cases of beer is dangerously close to breaking the bank while in others it hardly makes a dent in your wallet. Simple Thrifty Living compiled data on the average price of a 24-pack of beer in each state across the US and compared them to each other. The study used major domestic beer brands sold at national retailers across the US, so craft double IPAs that cost $17 a can are not factored in. A quick look at the map gives you a pretty good idea of the disparity in cost. If you live in Alaska, you’ll be paying the most for a 24-pack at an average of $31.21. Illinois residents, however, pay nearly half that much at $15.20. California and New York, which both have reputations for being expensive, surprisingly came in at $17.86 and $15.48 for a case, respectively, with Wyoming ($26.68) and Hawaii ($22.39) following Alaska for most expensive. 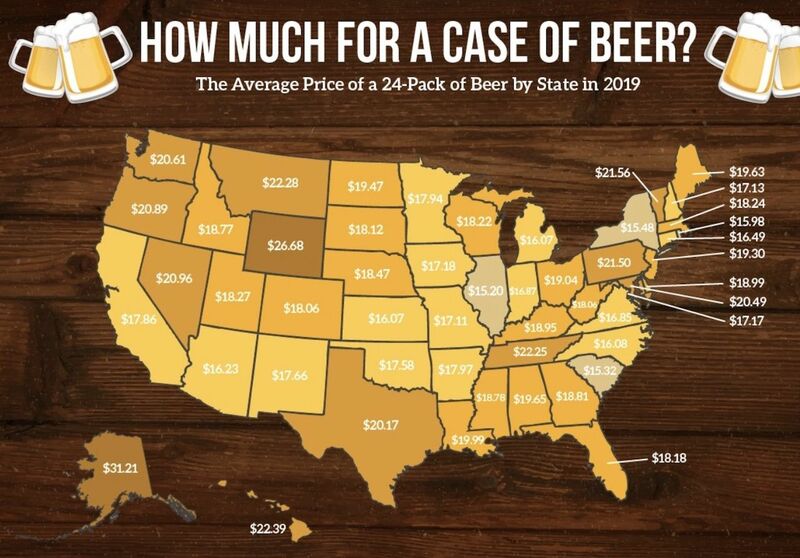 The findings represent a sizeable shift from last year’s study, which found that Michigan ($14.62) was the country’s least expensive state for beer while Pennsylvania ($21.98) was the most expensive. More like this: Beer hiking is a thing, and it’s awesome. Here’s where to do it.